Jesus was God, but he lowered himself. When he came down to earth, he was born in such a filthy and despised place, that many people didn’t believe he was the Messiah. “Can anything good come from Nazareth?” they asked about Jesus (John 1:46). God could have chosen to incarnate as a king or a priest — someone with power and privilege. But Jesus, though he was equal to God, brought himself down, not just to the level of humanity, but what his community considered the lowest level of humanity. He spent time with women, fishermen, tax collectors, and sinners. He didn’t come to be served, but to serve (Mark 10:45). The nonprofit I work with, Kibo Group International, strives to follow Jesus by serving with our rural neighbors. The Busoga region, where I live and work, is looked down upon by other Ugandan tribes. People in Busoga’s villages think low of themselves, and they look at Ugandans who live in town, like me, as above them. They kneel before me. They bring me chairs while they sit in the mud. But here at Kibo, my coworkers and I make it a point to sit in the mud with them. Jesus knew that the best way to connect with people is to meet them where they are. We don’t always do it perfectly, but we try to follow his example. So as I teach my lessons for my Kibo program, Health and Spiritual Empowerment, I sit in the mud. I dance with them. I mourn and celebrate with them. And I strive to follow Jesus in the curriculum of my program. Jesus healed the sick, so I teach people in the village how to care for their bodies. Jesus helped people understand Scripture, so I teach them how reading the Bible responsibly can help us improve ourselves, our families, and our communities. Jesus even helped his disciples be better fishermen! So I teach them how to improve their economic prospects by caring for chickens, too. Jesus prayed a lot. So I pray with the people in the village a lot, too. It would be easy for my Kibo coworkers and me to walk into our partner villages and demand people listen to us because we are town people. Maybe we’d draw bigger crowds. I don’t know. But I do know that if we walked into a village with swagger and authority, the community wouldn’t feel the love of Christ. They wouldn’t experience the profound sustainable change that we see happen in our partner villages because of their trust in us. And we’d be worse off, too, for not knowing and truly caring for our brothers and sisters in the village. Only service that is rooted in Jesus’ love, compassion, humility, and patience will eventually blossom into communities that will thrive for generations to come. That’s Jesus’ way. And we’ve tried to make that the Kibo way, too. Ida is among the founding members of Kibo Group and the Source Cafe, where Kibo is headquartered in Jinja. Currently she oversees the Health and Spiritual Empowerment Program. Ida visits villages to empower women and other disenfranchised community members, and to teach and unify communities through Bible lessons. 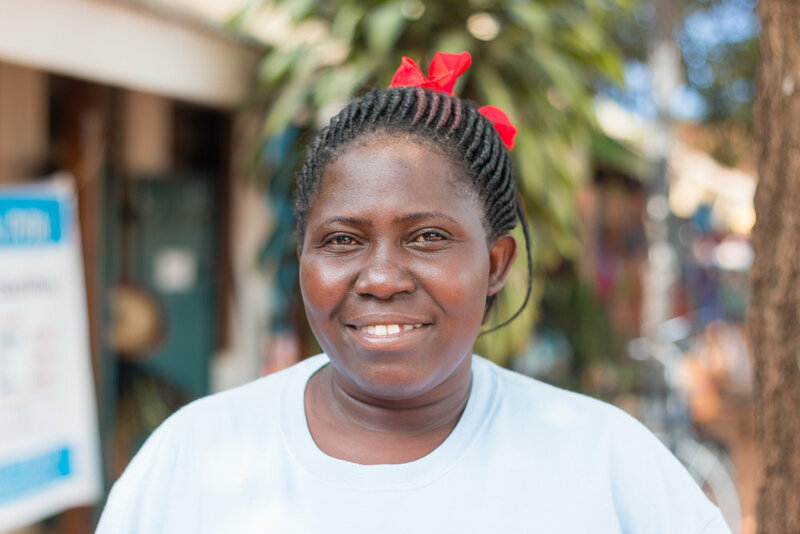 Ida serves at Jinja Church of Christ and has six children: Rogers, Sarah, Mark, Rebecca, Reuben, and Resty.